Don't Miss the United States Botanic Garden Holiday Display This Year! The United States Botanic Garden is beautiful and worth a visit any day of the year, but it becomes especially magical during the holiday season. 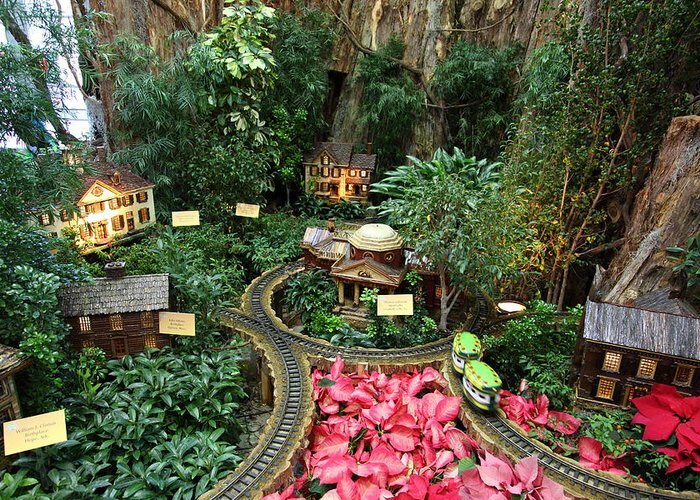 Every year the Botanic Garden puts on a holiday show called Season’s Greetings, and this year they'll be showcasing famous train stations around our nation, decorated (of course) with the most stunning holiday-themed details. And the best part? It's completely free. The show will start on Thursday, November 22, and go until the first of next year -- January 1, 2019. You’ll be able to visit the gardens every day from 10 a.m. to 5 p.m., but the most ideal time to go is in early December, on Tuesdays and Thursdays, as it will stay open until 8 p.m. those days. The gardens will also feature live music on those nights (Score!). This will be your chance to experience and learn about classic American train stations such as New York City's Grand Central Terminal, St. Louis's Union Station, and many more. There are some really wonderful historical tidbits to be learned about different train stations that shed light on how our cities developed. And the Botanic Garden wouldn’t pass up the chance to showcase its most gorgeous flower arrangements and plants during this time of year! Make sure you bring your camera to get a lot of pictures of you and your loved ones here. I promise -- this will be a great opportunity to level up your Instagram game. Check out the Botanic Garden's website for more information. Have you been to a holiday event at the Botanic Garden before? What's your favorite holiday tradition in the DMV? Tell us about your experience in the comments below! Looking for an interactive museum in D.C.? Here are three of the best!